Choosing the golf ball you use will affect your game. Golf ball engineering has come a long way since the more primitive days of the game, when the properties of golf balls were largely inconsistent and not necessarily designed with optimal physics in mind. Today, golfers can find dozens of unique ball styles from a single manufacturer. The upside to this situation is that it's easier to find a ball that suits your swing, but it comes at the expense of more complicated shopping decisions. Consider all of these concepts to choose your balls with the utmost care, thereby ensuring the best chance of a satisfactory purchase. Spend some time browsing through the golf balls for sale online and in your local pro shops. It's helpful to do this right off the bat so that you can see just how many different options are available, as well as to familiarize yourself with the types of claims made on golf ball packaging. As you browse, focus on these claims and the various ways in which each manufacturer rates each ball style so that you can better understand the factors that will go into your purchase decision. You'll find a link to a popular retail golf ball site in the Resources section below. Compare golf balls in the one-piece, two-piece, three-piece and four-piece categories. These references to "pieces" indicate the number of different layers that comprise the ball design. 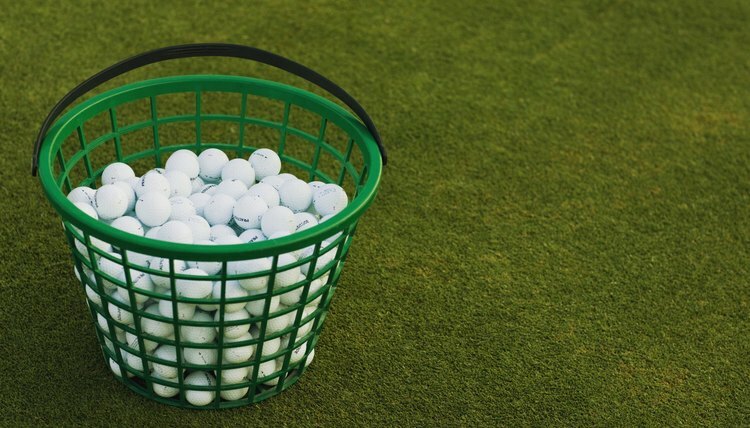 Though there are some exceptions, balls with more pieces tend to be more sophisticated in design, more expensive, better long-distance balls, better high-loft balls and better suited for more experienced golfers. Consider your skill level and choose your category accordingly. Check the spin ratings of the balls you are considering. Lower-spin balls don't stay airborne very long, but tend to roll farther on the ground. Higher-spin balls exhibit the reverse--longer air time, shorter rolling distance. It's generally recommended that you use the highest-spin ball you think you can handle, though higher-spin balls tend to be harder to hit because they can slice more severely when you fail to land a solid shot. Check the outer-surface hardness of the balls you're considering. This measure of hardness may be referred to as "feel" on the ball packaging. Firmer balls tend to be more resilient and capable of greater distance on drives and long shots, but can be harder to control on the green and when making tricky shots. Softer balls are just the opposite, although a skilled golfer with a strong swing can usually drive a soft ball just as far, if not farther, than an average player using a firm ball. Consider softer balls if you're looking for greater accuracy on greens, and harder balls if you're looking for greater distance on drives. Consider all of the factors described above to create a list of specific golf ball designs that you think might be right for you. Once you've identified a few types, look them up online to see if you can find reviews written by golfers who have used them. These reviews often give insight into how well the balls live up to their marketing claims. Ask your local pro shop staff for recommendations. They may be able to show you ball types you've never seen before, and they tend to be knowledgeable. Be sure to discuss your swing and the strengths and weaknesses of your game so that the pro shop staff can give your customized suggestions. Purchase small numbers of different types of balls and practice with them, changing ball types regularly. This is important because, when it comes down to it, the only way to verify that a ball is right for you is to play with it. But by completing all of the above steps first, you can save money by buying only those balls that have been pre-qualified to meet your needs. When you find the perfect ball through this final process, you can buy them in larger packs.